GrowRVA is headed to the beach … Colonial Beach! 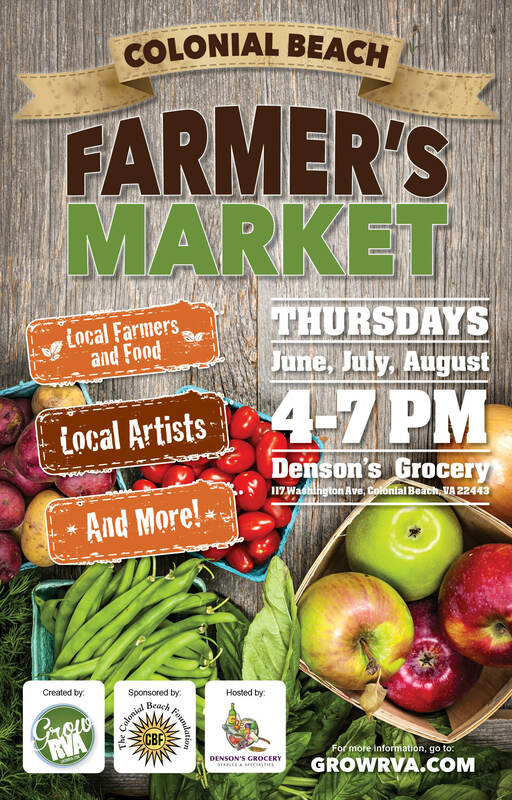 This Thursday our Colonial Beach Farmers Market kicks off at 4pm at Denson’s Grocery. There are a number of farms at the South of the James Market that call the Northern Neck region home…. Walnut Hill Farm, Reyes Farm, Norma’s Produce and Grandma’s Garden are all located in Westmoreland County; and Black Boar Farm is not too far away in Essex County. After many farm visits, we fell in love with the area. Okay, so it didn’t take many visits to fall in love. It happened pretty quickly. It also didn’t take too long for the idea of starting a farmers market in Colonial Beach to take shape either. Fortunately for us, we have some local food loving partners. We have teamed up with Colonial Beach Foundation and Denson’s Grocery to bring a GrowRVA style farmers market to the beach. Black Boar Farm – Free range Berkshire and Ossabaw Island hogs, honey, chicken, soap, lip balm, hand creams, honey body scrub, beeswax candles, honey candy, creamed honey and fruit & honey jam. Handmades by Linda – One-of-a-kind jewelry – handmade sterling silver, gold-filled and copper jewelry featuring semi precious stones. Wandering Cow Farm – Handmade natural soaps, lotions and moisturizers, liquid soap, shampoo, bath salt and sugar scrub, wool, yarn and felted animal art. Westmoreland Berry Farm – Fresh berries and more! Please do come out and see us! Next Next post: Wedding Day at SOJ!